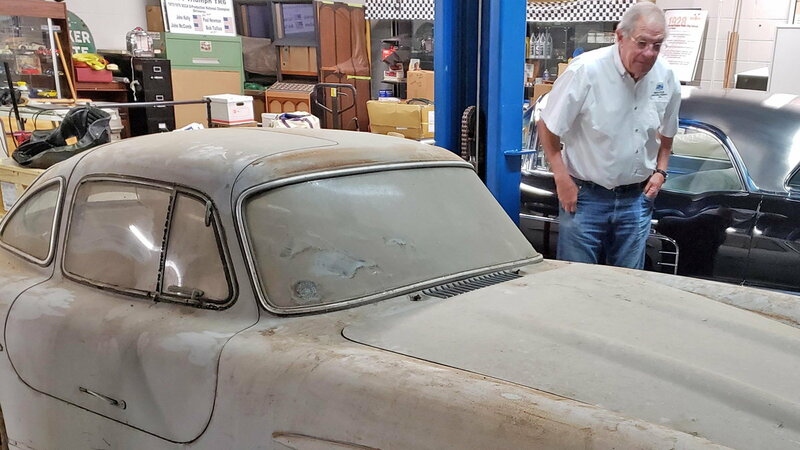 Slideshow: A classic car once parked in storage with the intention of getting a paint job was left for decades until doors were reopened and it emerged from the garage. Despite spending over 20 years in storage, the ending for this 1954 300SL Gullwing is a happy one. It's not unusual for car owners to park their beloved classics in the garage for the winter, or perhaps a bit longer. However, most people then remove their vehicles from storage at some more appropriate time and continue on with their plans. Sometimes the vehicles need a full restoration or some DIY repairs to keep the car in top running condition. 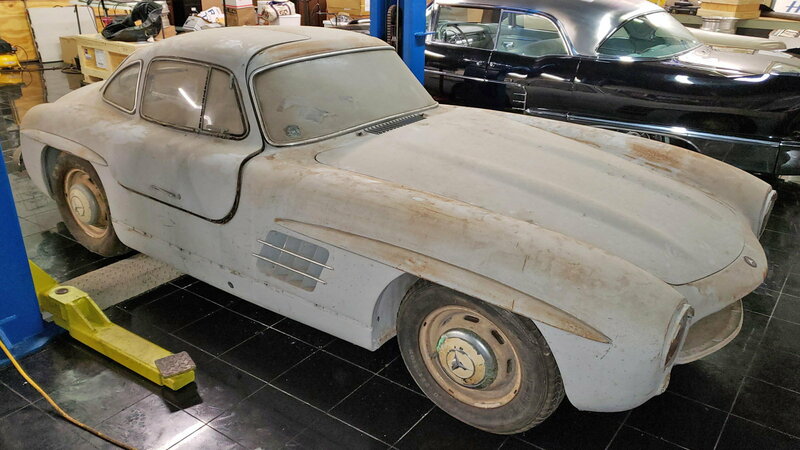 This incredibly rare 1954 300SL Gullwing was parked in a storage unit in Ponte Vedra Beach, Florida, by its original owner, but it hasn't seen the light of day again for over two decades. While the name of the original owner of this classic coupe hasn't been revealed, it was Amelia Island Concours d’Elegance founder and chairman, Bill Warner, who ultimately tracked down the vehicle after seeing it over 20 years ago. At the time, recalls Warner, the coupe, which was the 43rd out of 1,400 ever made, was in pretty good shape. In fact, once he convinced the owner to open the storage unit, Warner remarked that the vehicle looked largely the same as it did before it was parked in storage. The original owner stored the car with a coat of primer, intending to get it repainted at some point. It appeared to have last been driven in 1965, according to Warner, although the vehicle appears to have been moved twice within the area during those years in storage. 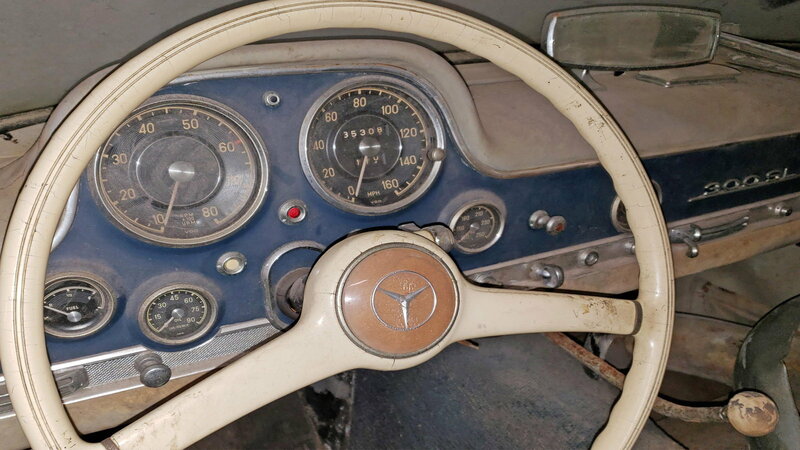 >>Join the conversation about this classic 300 SL Gullwing barn find right here in MBWorld. Its iconic wing-shaped doors earned this Mercedes-Benz classic the name of Gullwing. The unique doors were essential to fit the vehicle's high side frame. The vehicle was first introduced in 1954 in New York and remained in production through 1963. However, only 1,400 of the vehicles were designed as coupes. The rest featured a convertible body with regular doors. Its sleek design and relatively lightweight construction enabled the Gullwing to reach speeds up to 160 miles per hour, boosted by a 215-horsepower output. 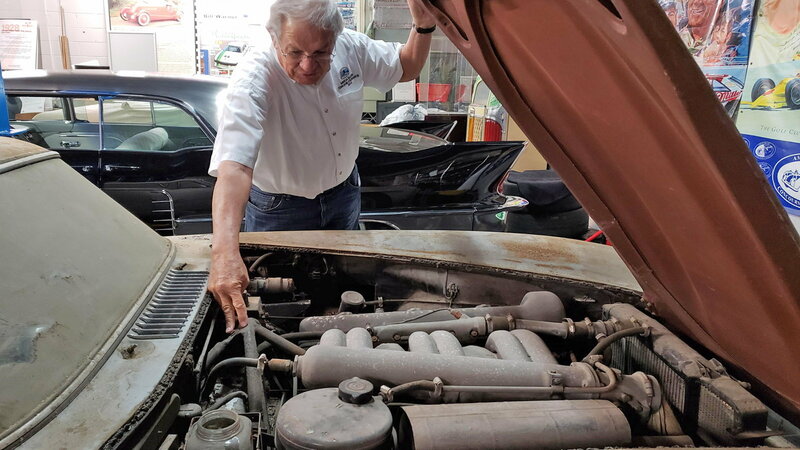 In many cases, you'd expect to find more than a thick layer of dust on a vehicle that's been sitting in storage for decades. 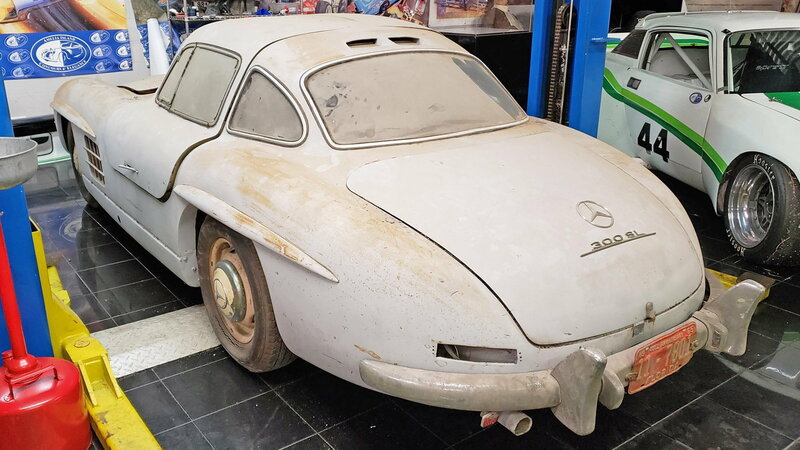 This Gullwing emerged missing a few pieces here and there, but that's not because of the time it spent out on the road. In addition to a coat of primer to get the car ready for a paint job, the original owner had also removed the exterior and grille, along with the chrome pieces. While the SL's looks didn't fade much on the outside, this Gullwing would need a full restoration to get it back to its original beauty. After all, the original 3.0-liter six-cylinder engine hasn't run for nearly two decades! After some persuasion by Warner, who suggested to the Gullwing's owner that his car is purchased and restored by experts, the vehicle was sold to the Mercedes-Benz Classic Center near Los Angeles. Otherwise, the cost of restoring the rare classic car could cost at least $600,000, according to Warner. In addition to being able to source parts for the car, there are other resources available at Mercedes-Benz Classic, such as the original blueprints and drawings to aid in the process. The car was carefully reassembled, with even with the dust left intact. It was displayed at the 23rd annual Amelia Island Concours d’Elegance in Florida in March of 2018.